Happy new year to you all! I hope it is a prosperous one for everyone! I am feeling a little overwhelmed, confused and generally out of sorts so far this year. I have so much to catch up on I don't know where to start. If this year is as good as last then it will be amazing but I just know I have to be a lot more organised. I have exhibitions galore, commissions, solo shows, gallery stock ups and a wedding to organise. I am not at all being negative about it all just simply swamped. I know I need to start sticking to a routine and try not to be sidelined by reading blogs and generally spending too much time on the computer. Gosh it feels so good to write this stuff down, it feels the first step back into reality and my head is already clearing. New Year in Paris was not really the dream I had hoped. Everything that could go wrong did. We were flying out on New years eve and our flight was delayed by 2 1/2 hours so we only just made it there in time for New year. We spent midnight up at Sacre Coeur but then there was real trouble in the crowd so we left rather scared and in a hurry. The following day the crowds everywhere were unbelievable so we didn't get to the top of the Eiffel tower. I didn't fancy a five hour queue, Sorry Sean. Then Tuesday when we had planned a day of galleries, they were all closed!!!!! Sean wanted to see the Mona Lisa and we had both been really looking forward to the Herge (Tintin) exhibition at the Pompidou. Most shops were closed too. So there we go, and there are so many stories I am leaving out.We can look back and laugh at least. 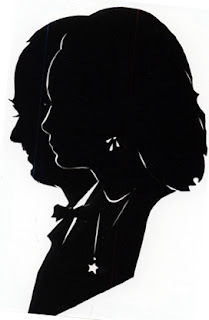 There were some really special moments though, like the Japanese guy that cut out this silhouette of Sean and I in one cut and just 4 minutes. We were in Montmartre and he sat us down and started cutting. People were fascinated and we suddenly had a crowd of about 40 people watching, it was so surreal but a lovely moment I shan't forget. The likeness is uncanny in parts and flattering but it is undoubtedly us! What talent this guy has and we only paid 10 euros. I also discovered a fun little company whilst there called Madamemo. One of the dolls came home with me. I am enjoying reading and catching up with all the New year blogs and it is helping me get back into the land of living as I feel the last couple of weeks have been a bit of a blur! It is taking time though. I really love 3191!, the new project from Mav and Stephanie, and I have my eyes glued to a few items on the Kim family auction. Go and check it out if you haven't already. I spent yesterday tidying, organising and clearing my studio so now I am raring to go! Really!!!! So sorry new year turned out like that...wishing you a great 2007, even better than the last! Youre getting married - enjoy and make a list! Look forward to seeing new works. hello again janet, i would be happy to explain how to add a banner...so easy...have you got an email address? i am in the same boat of overwhelmed-ness.... happy new year though... i'm sure you'll pull thru!